A call to Moran Yacht & Ship brings news that they've taken over the central listing on the 44m motor yacht Lady Sheila with a €2 million price cut. Built in 2009, she’s one of Benetti’s Vision 145 series of full displacement yachts designed by Stefano Righini. She can accommodate up to 12 guests in a five stateroom layout. Her interior was designed by Bannenberg & Rowell and includes a central elevator, large entertaining areas and a gym. 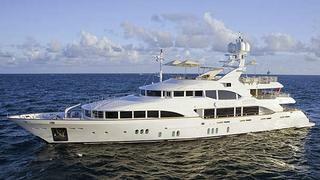 Lady Sheila is now asking €14.9 million, down from €16.9 million.